There are some cars that just make us smile. It is a combination of lines, size and for some it is the name and what it congers up. Franco Scaglione while at Bertone, designed the 1966 Alfa Romeo Giulia Sprint Speciale. It is one of those designs that brings out a smile in me every time I view one. Not from a humorous slant, but by the ways the lines converge. They feel odd at times, yet at the same time right and satisfying. By eliciting a smile from the pure pleasure of exploring his lines and design, Franco has become one of my favorite automotive designers. Bubble cars produced by BMW bring out smiles from old and young alike. At an event last year in Aspen, CO. Wayne Carini had this red Isetta at an auction. It was fun to see the faces of the children as he would help them into and out of the his car. It was pure joy and excitement as they saw the front of the car open up for the first time and were able to sit inside and look out. 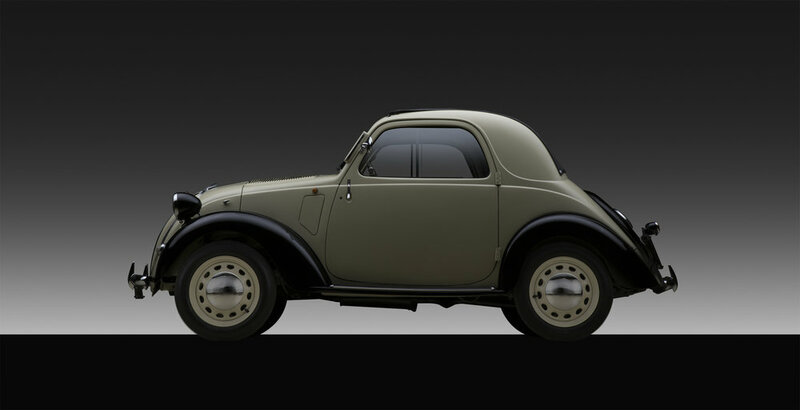 Who can not resist the playfulness of a 1948 Fait 500B Topolino? It does not take much imagination to look at the car and understand where the styling cues came from and what the english translation of the Italian word Topolino is. Well, Micky Mouse of course. This one may just be me, but the name alone makes me smile. Lloyd. It has quite a heritage being part of the Carl F.W. Borgward lineage. Like the Borgwaard Isabella it has quirky lines that feel odd yet satisfying at the same time. Add to the list of cars that make you smile and why.